I’ve got a two-part article on Thrive Global up today, around the concept of overwork as laziness. We think of overwork as a sign that we’re in-demand, living life to the fullest, fulfilling the Protestant Work Ethic, etc. ; and as economists and sociologists have noted, in the last thirty or so years, long hours have even become a status symbol among professionals and better-off workers. But this is a very new way to think about overwork, as I note in part 1. 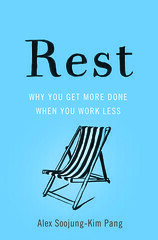 For a long time, philosophers and theologians (ranging from the Roman Stoic Seneca to German theologian Josef Pieper) warned that overwork was a kind of laziness. And it’s one we should abandon. In fact, as I explain in part 2, some smart companies are already doing that. They’re scaling back on working hours, and their leaders are motivated to do that in part because they’ve come to see overwork as a signal of organizational failure– not a sign that you’ve got highly-motivated employees who want to Crush It, but that you’ve got managers who don’t know how to plan and prioritize.